Pakistan appears to have a second international customer for its domestically assembled Aeronautical Complex/Chengdu Aerospace Corporation (PAC/CAC) JF-17 “Thunder” multirole fighter jet after Myanmar. According to local media reports, the Pakistani government’s Economic Coordination Committee (ECC) has approved a $184.3 million sovereign guarantee covering the delivery of three PAC/CAC JF-17 Thunder fighter jets to the Nigerian Air Force under a recently signed contract. 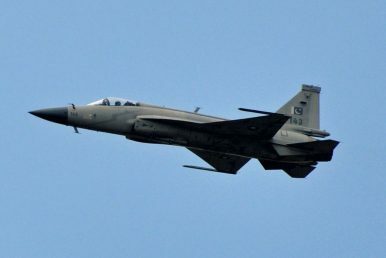 This is the first confirmation that a contract between Pakistan and Nigeria for the procurement of JF-17 fighter jets has been concluded, although Flight Global reported earlier this year that the Nigerian 2018 defense budget included $36 million earmarked as partial payment for the three fighter jets. Pakistan and Nigeria purportedly inked a memorandum of understanding for the purchase back in 2016. Notably, Nigeria’s 2016 federal budget reportedly allocated $25 million for three JF-17 fighter jets and $9 million for 10 PAC Super Mushshak trainer aircraft, a PAC licence-built variant of the Saab MFI-17 Supporter aircraft. Powered by a Russian designed but Chinese license-built Klimov RD-93 (a RD-33 derivative) turbofan engine, the JF-17, a light-weight single engine multirole combat aircraft, has a combat radius of up to 1,200 kilometers without refueling and can reach a maximum speed of up to Mach 1.6. The aircraft is capable of carrying a weapons payload of over 3.5 tons and can be armed with a variety of air-to-air, air-to-surface, and anti-ship missiles. The PAF is expected to induct 150 JF-17 combat aircraft over the next years, split into three productions blocks: Block I, Block II, and Block-III. PAC has so far produced 50 Block I aircraft and 50 Block II JF-17s. Twelve more Block II JF-17 aircraft are expected to be rolled out in 2018. Pakistan is estimated to be capable of assembling up to 25 JF-17 aircraft per year without technical or logistical assistance from China. (PAC produces 58 percent of the airframe and CAC 42 percent.) Once the Block-II JF-17 order is complete this year, PAC will switch to producing the aircraft’s most advanced version. The two-seat trainer variant of the JF-17, designated JF-17B, could be the basis for the JF-17 Block III variant. The PAF’s JF-17 is also slated to be retrofitted with a Chinese-made active electronically scanned array (AESA) radar system, according to Chinese media reports. The latest version of the aircraft will also feature a new electronic warfare suite.